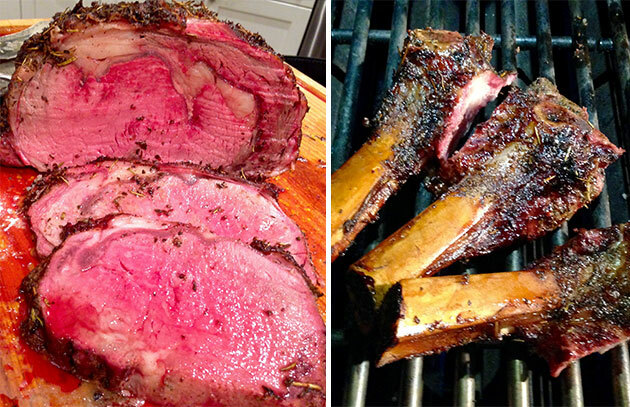 Prime rib costs more than virtually every other cut of meat at the market. It’s intimidating, too, because a roast that’s perfectly cooked or hopelessly overcooked can make or break your reputation as a grill master. I can feel the fear on social media channels this time of year. Many of you have posted photos of recently acquired hunks of meat on my Facebook page and Twitter account (my kind of pinup! ), complete with the price you paid in full view (usually in three figures). The message is clear: Steven, I don’t want to mess this up! Today, I’d like to reverse myself—reverse being the key word. This year I’m using the “reverse sear” method. Reverse-searing has flooded the blogosphere recently. So you might be surprised to learn that it’s been around since 2001 when one Christopher Finney, member of the competition cooking team Iron Pig BBQ, claims to have invented reverse searing. In a nutshell, you smoke or indirect grill thick cuts of beef and other meats to within a few degrees of your ultimate desired internal temperature, rest them, then sear at high heat. The result is meat that is uniformly pink across its diameter—cooked to temperature—with a beautifully crusted exterior. (Traditionally, meat is seared, then roasted, a technique that yields a “bulls-eye” effect, where a blood red-center is surrounded by concentric rings of pink, then grey, then brown meat.) This method works for all sizes of prime rib, from a modest 2-bone piece that will feed four, to a massive 7-bone piece that will feed up to 20. Here’s a simple blueprint for prime rib success. (Click for more information on buying and preparing prime rib.) Before starting, make sure you have an accurate instant-read or remote meat thermometer. Generously—and I mean generously—season the meat with coarse salt (kosher or sea) and freshly ground black pepper on all sides at least an hour before cooking or even the night before. I personally like to rub the roast first with extra virgin olive oil, minced garlic, and chopped fresh rosemary. Let the meat rest, uncovered in the refrigerator, on a wire rack set over a rimmed baking sheet. Set up your grill or smoker for low-temperature smoking and preheat to 225 to 250 degrees. 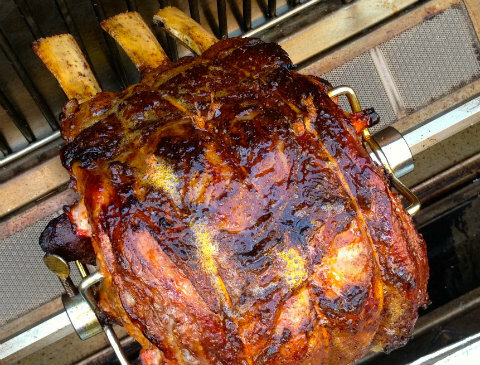 Roast the meat until the internal temperature is 5 to 10 degrees below your desired finished temperature. For me, that’s 120 degrees. (Temperatures in well-marbled meats should be high enough to melt the intramuscular fat.) This could take up to 4 hours. A remote thermometer or a device like a Maverick is a big help. Sear the outside of the prime rib directly on the grill grate over high heat; don’t forget the ends. Remove the bones, if applicable, and slice the meat. (Keep the bones for yourself!) For people who prefer their meat medium or well-done, direct grill their portions while the grill or smoker is still hot. I write these words on this, the winter solstice—the shortest day of the year. But I know in this barbecue community, our fires always burn bright. Wishing everyone happy holidays and a happy, healthy, safe, and smoking New Year!